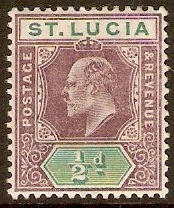 St Lucia 1902 ½d Dull purple and green. SG58. Mounted mint 1902 ½d Dull purple and green. SG58. King Edward VII definitive stamp. 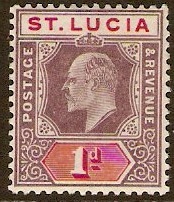 St Lucia 1902 1d Dull purple and carmine. SG59. Mounted mint 1902 1d Dull purple and carmine. SG59. 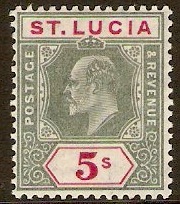 King Edward VII definitive stamp. 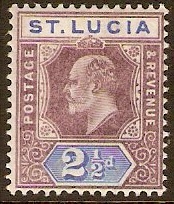 St Lucia 1902 2½d Dull purple and ultramarine. SG60. Mounted mint 902 2½d Dull purple and ultramarine. SG60. King Edward VII definitive stamp. 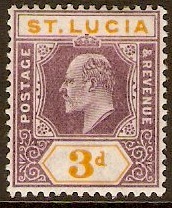 St Lucia 1902 3d Dull purple and yellow. SG61. Mounted mint 1902 3d Dull purple and yellow. SG61. 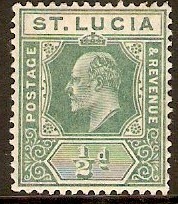 St Lucia 1902 1s Green and black. SG62. 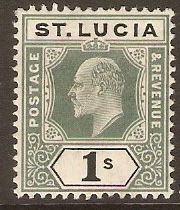 Mounted mint 1902 1s Green and black. SG62. King Edward VII definitive stamp. 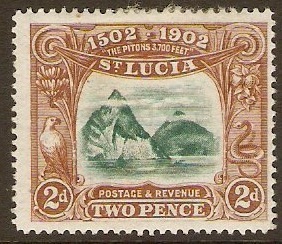 St Lucia 1902 2d Columbus Anniversary Stamp. SG63. Mounted mint 1902 2d Columbus Anniversary Stamp. SG63. 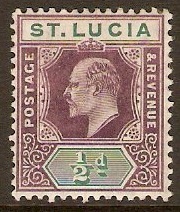 St Lucia 1904 ½d Dull purple and green. SG64. Mounted mint 1904 ½d Dull purple and green. SG64. 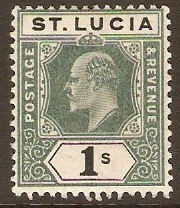 St Lucia 1904 ½d Green. SG65. Unmounted mint 1904 ½d Green. SG65. 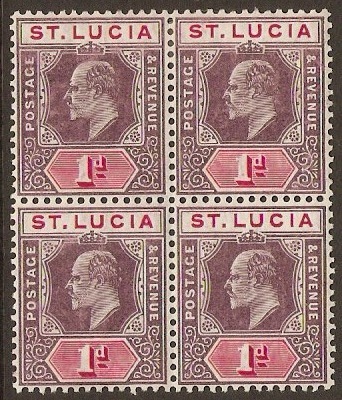 St Lucia 1904 1d Dull purple and carmine. SG66. Unmounted mint 1904 1d Dull purple and carmine. SG66. King Edward VII definitive stamp. 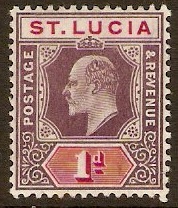 Mounted mint St Lucia 1904 1d Dull purple and carmine. SG66. King Edward VII definitive stamp. Block of 4. NOTE: Bottom 2 stamps unmounted mint.